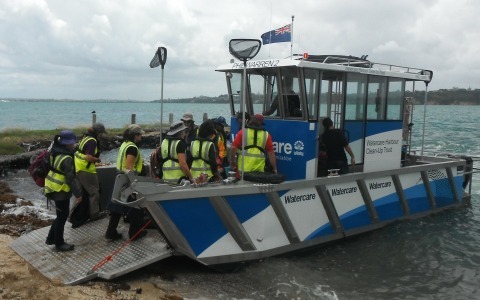 The ‘Phil Warren II’ is the latest addition to the Watercare Harbour Clean-up Trust’s arsenal for fighting rubbish in the Waitemata Harbour and surrounding islands around Auckland. The vessel is a purpose built 8.7m aluminium barge to suit Harbour Clear-up Trusts requirements that include being able to transport up to 28 volunteers over short durations and transporting the collected rubbish back to shore. Here at Clever Fox Projects it was our job to check that the vessel meets the requirements of being a passenger vessel (Rule 40A) and a non-passenger commercial vessel (Rule 40C) under Maritime New Zealand rules. 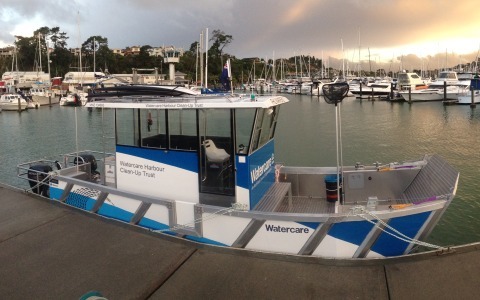 This involved a full assessment of the vessel’s structure, layout and equipment with respect to each rule’s requirements. As a vessel wanting to carry more than 1000kg of cargo we also completed a full stability assessment and stability book with respect to loaded and unloaded conditions that the vessel is going to face in service.